CES 2017, the 50th anniversary of the largest global gathering of innovation and connectivity, concluded yesterday, introducing ground-breaking products and providing opportunities for companies in major global industry to conduct business. CES 2017 showcased the connected future of technology. With more than 3,800 exhibiting companies and exhibit space of more than 2.6 million net square feet, CES 2017 was a record-breaker, hosting the world’s biggest companies in addition to more than 600 startups at the Eureka Park Marketplace. “CES 2017 was a global showcase that demonstrated that we are in a new era of innovation where technology is valued not just for the devices it produces but for the experiences it makes possible,” said Bridget Karlin, managing director, IoT, Intel. Connectivity was everywhere at CES 2017 – enabling nearly every product category, from self-driving cars and smart cities to digital health and 5G – and a major focus throughout CES conference tracks. During Friday morning’s keynote, Qualcomm CEO Steve Mollenkopf introduced the 5G future, a new kind of network with unprecedented scale, speed and complexity. "5G will be the tipping point that builds on LTE and finally enables IoT," said Mollenkopf. During the keynote, Qualcomm introduced the Snapdragon 835, the first 10 nanometer mobile processor that can deliver extended battery life, built-in security, eye-based authentication, secure audio, on-device machine learning and immersive experiences. “CES 2017 was a coming out party for the future of 5G, which we estimate will generate a net 20 million new jobs,” said Dr. Jim Mault, vice president and chief medical officer, Qualcomm Life. Under Armour is innovating by investing $1 billion in health and fitness tech. Plank unveiled three new models of the company’s Record Equipped shoes, which give performance feedback based on workouts. Michael Phelps, the most decorated Olympian of all-time, joined Plank onstage to demo the shoes and talk about UA Healthbox, powered by UA Record, the world’s first connected fitness system. The keynote wrapped with the unveiling of a new line of sleep apparel, dubbed Rest Win Repeat, in collaboration with Patriot’s quarterback Tom Brady, designed to rebuild the body while it rests through infrared technology. Top industry executives and influencers joined global government officials at the annual Leaders in Technology Dinner on Friday evening. Ford President and CEO Mark Fields shared the company's vision for how the future of mobility will be transformed by connectivity. "Imagine what could happen when the way you get around looks completely different. Cities will change. The way we work and play and socialize will transform. And it will all be enabled by connectivity," said Fields. Fields announced that Ford Sync is expanding to deliver cloud-based services and that soon all Ford vehicles will be controlled remotely with the FordPass app. He also recapped Ford's recent partnership with Toyota to form the SmartDeviceLink Consortium to establish industry-driven standards for in-vehicle apps. U.S. government leaders in attendance included three members of the Federal Trade Commission, three members of the Federal Communications Commission, U.S. Department of Transportation Secretary Anthony Foxx, along with U.S. Senator Dean Heller and seven members of the U.S. House of Representatives. Other top level U.S. government attendees included representatives from the Federal Aviation Administration, Department of Energy, Department of Homeland Security, International Trade Commission and Patent and Trademark Office. Notable global political leaders in attendance included His Royal Highness Prince Constantijn of the Netherlands; Franҫois Fillon, French presidential candidate; Axelle Lemaire, France’s Deputy Minister for Innovation and Digital Affairs; Henk Kamp, Dutch Minister of Economic Affairs; Jaime Reyes Robles, Secretary of Innovation, Science and Technology, Government of the State of Jalisco, Mexico; Adebayo Shittu, Nigeria's Honourable Minister of Communications; Navdeep Bains, Canada’s Minister of Innovation, Science and Economic Development; Brad Duguid, Canada’s Ontario Minister of Economic Development and Growth; and Matt Hancock MP, Minister of State for Digital and Culture, Department for Culture, Media and Sport, UK Government. CES hosted attendees from more than 150 countries and more than 100 official national delegations. “This is the one show where I can see all of my international partners in one place. It is the one event where I invite them, and they all come,” said John Ivey, president and CEO, MiTek Corp. and AtlasIED8. CES 2017 drew celebrities from Hollywood, sports, eSports and music to experience the latest in tech. Ambassador Aisha Tyler; Major League Baseball All-Star Bryce Harper; NBA Hall-of-Famer Shaquille O’Neal; U.S. Olympian Michael Phelps and actress Octavia Spencer were among the stars participating in the show. CES 2017 also hosted competitive contests, including the Best of CES awards, presented by Engadget, and the Mobile App Showdown, presented by Living in Digital Times. The semi-finals for Richard Branson’s Extreme Tech Challenge (XTC) also returned for a chance to compete in the final round of competition at Branson’s Nekar Island. Now in its third year, the annual CES Asia will run June 7-9, 2017 in Shanghai, China, showcasing the latest ideas and innovations from global brands and promising startups. 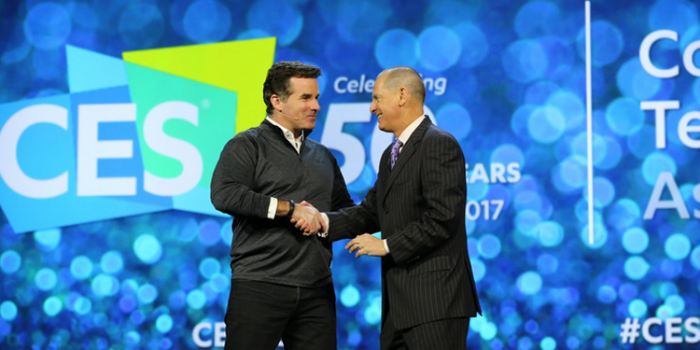 CES will return to Las Vegas Tuesday, Jan. 9 through Friday, Jan. 12, 2018.